The count down is on for Winx to return to the racetrack and she indicated at the Rosehill barrier trials this morning that she is ready to take off in the Group 2 $250,000 Apollo Stakes (1400m) at Randwick on February 16. Winx, above, is on track to resume in the 2019 Apollo Stakes at Randwick. Photo by Ultimate Racing Photos. Winx is ready to begin her final racing campaign before retirement and the World’s equal top rated race horse showed that she is at the top her game with a solid third in a 1000m barrier trial on the Rosehill course proper. Regular rider Hugh Bowman, fresh back from a Group 1 win at Hong Kong on the weekend, settled Winx three wide in the second half of the eight horse field after jumping on equal terms. Bowman never released the reins and the mighty mare went to the line under her own steam to finished just on a length from the winner Spright with Cool Passion in second spot. Trainer Chris Waller said he was very pleased with what he saw in the trial and added that Winx could have a special race day exhibition gallop before the Apollo Stakes. “We’ve allowed an extra week, so we’ve got it up our sleeve if we need it,” Waller said. “I was very happy with that. She’s the ultimate professional and this morning’s trial was perfect to my eye. Today’s trial was Winx’s second this preparation after finishing seventh in a 900m Rosehill barrier trial on January 15. Waller and connections have announced that the 2019 Sydney Autumn Carnival would be Winx’s last campaign before being retired and a trouble free run would see the four times Cox Plate winner say farewell in the Group 1 $4m Longines Queen Elizabeth Stakes (2000m) at Randwick on April 13. Winx is the winner of twenty-two Group 1 races which includes the last two running of the Queen Elizabeth Stakes which helped make up her twenty-nine straight wins. 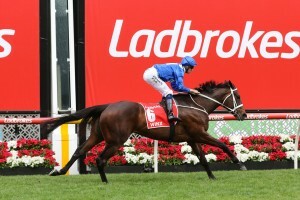 Winx is marked at $1.10 at Ladbrokes.com.au to win her third Apollo Stakes after victories in 2016 and 2017 while in the Queen Elizabeth Stakes betting the mighty mare is the $1.20 favourite.